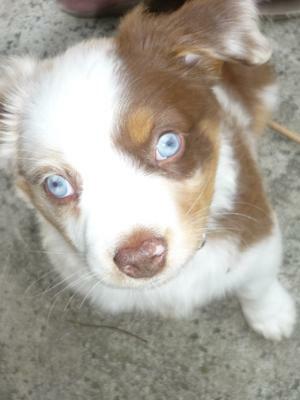 This is a photo of my 4 1/2 month old red merle Aussie, Cochobhar-Versace(Connor-Versace). He's such a smart, beautiful and fun little boy! Every time I look at this photo I am reminded of how he's "my little puppy love". Eventually, after basic obedience training, I'll be training him to be my service dog. He means the world to me! He lives with me, my best friend, my cat and my daughter in Orange County, California. he knows several commands in spanish and english! He's the best! Thank you for letting me share him with you! ahh, thank you so much for sharing him with us. he is beautiful. you said he will be your service dog, may I ask how? just curious. well, enjoy your puppy love, and be well.